Every year, I’m hurled – half sprinting, half carried by my own inertia – towards the last hour, only to leave a short but thick streak as I come to a screeching halt at the edge of an enormous divide between the expiring and the aspiring. Before mindlessly throwing myself into the new calendar, I force myself to pause and wade into the outgoing year’s jumbled memories and notes, mental and jotted, that I’ve left haphazardly thrown in a corner amidst a blur of flights, reservations, names, and emails. Thankfully, I usually don’t have to look too hard. That old saying is true: the cream rises to the top. If I give a it a good stir, the good ones surface quickly. If you’ve been following this blog for a while, you know that simplicity, quality, and flavor (the first cannot exist successfully without the latter two) are what I value most in food. 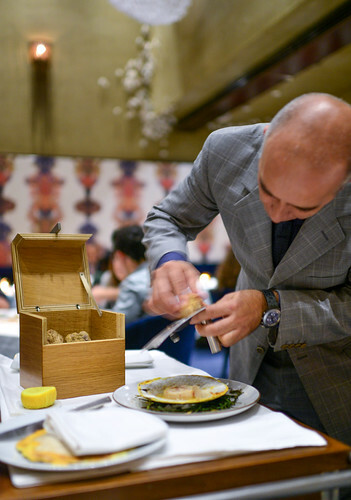 And that’s what you’ll find in common among my 25 favorite dishes from 2014: a scallop roasted in its shell with a knob of butter; a strip of slip sole, naked but for a glistening veil of butter flecked with seaweed; and dry-aged beef served with little more than a spoonful of it’s own tallow and juices. This is how I like to eat. This year’s list is comprised of food from all corners of the world, some found in unexpected and unlikely places – a Belgian farmhouse; a crowded noodle shop in Hong Kong; a cobblestoned courtyard tucked among the labyrinthine streets of a medieval, walled city near the coast of France. And of course, some from restaurants that have proven to be dependable founts of good eating: three of the restaurants you’ll find below have appeared before. Not surprisingly, Japan produced some of the best food I ate this year. Dishes from that trip dominate the top ten spots and represent over a quarter of the entire list. Among them, my love of rice is made apparent. Rice is not only a comforting reminder of my own, Asian-American childhood, it’s also a clean sounding board off of which other flavors can be showcased. Although it’s a relatively inexpensive and simple food to cook, rarely is rice made as well as the versions you’ll read about below. Great food – the type that truly inspires and endures – comes often as a pleasant, unexpected surprise. I love that this is so. Despite all of my international travel this year, the starry host I visited, and the mythical culinary “gods” I encountered, gifting the world with their Olympian ambrosia, a young American in a foreign land with no Michelin star (not yet, anyway) bested them all with an austere, but spectacular dish that he claims to have thrown together spontaneously: some roots, some fruit, a spot of warm oil. You never know when or where good food will appear. That’s why I’m always eating. Out of thousands of dishes that I tasted at over 250 restaurants in a dozen U.S. state, eight countries spread across three continents, and representing over 75 Michelin stars (you’ll find a comprehensive list of them here), I give you my 25 favorite dishes of 2014. 1. The title of each dish below is hyperlinked to a photo of that dish. 2. Please see the footnote about bread at the end. 3. 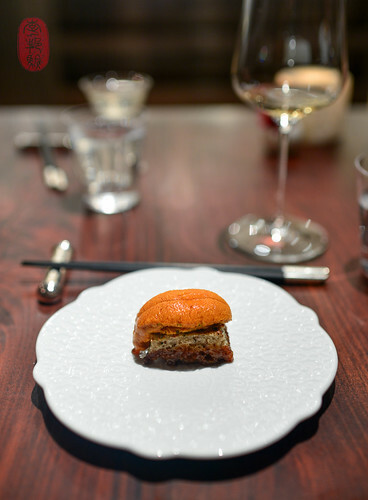 A link at the bottom of this post takes you to ten more dishes from 2014 that I deem worth mentioning. Sirens and flashers lit up every street corner in Berkeley as my friends and I settled around a circus-sized lazy Susan at Great China, a Berkeley institution that recently reopened in a cavernous new space after a fire had destroyed the original. The wine list there is unbelievable (Beverage Director Mark Yatabe is an oenophile who maintains a shockingly well-stocked cellar), and the food was all very good (the Peking duck – presented in one service, not two – is notable). But the walnut shrimp… The fried batter was puffy and light, and the shrimp within were plump and tender, with just a bit of snap. The walnuts were crisp and crunchy. And all of it was glazed in a sugary slurry with a splash of orange. If protestors ever shut down I-80 again, I’ll happily wait them out at Great China over a plate of these shrimp. (Incidentally, it paired beautifully with a bottle of Weingut Dönnhoff Oberhauser Brücke Riesling Spätlese, 2013). I love the way the French pronounce this fish: shin-shar. Tiny, but feisty, Raquel Carina, the Argentine proprietress of this cozy bistro in Belleville (that’s in the far-flung 20eme), served us this blushing-pink strip of raw chinchard with little more than some oil, salt, and a splash of smoked vinegar. Salted butter, white truffle, lemon. Spicy curry with beef tendon and wide noodles. We ducked into Kau Kee from the torrential downpour outside and crowded around a small table, all of us dripping wet from rain and sweat. Hong Kong in the summer is miserable. I didn’t have to look at the menu twice: beef curry noodles for me. It’s my favorite; and this popular noodle shop happens to make an exceptionally good version. The broth was dark and spicy and everything bathing in it – the noodles, the ropey strands of tender beef, and the nuggets of beef tendon – were stained yellow with curry. I happily disappeared into this hearty bowl as we waited out the rain. This giant globe artichoke was so large that I was only served half of it. It arrived hot and steaming, unceremoniously spliced down the middle, dripping with butter and crunchy with sea salt. The artichoke was served with a side of vinaigrette so emulsified it looked like crème fraîche (In fact, I asked chef Alexandre Gauthier if there was any dairy in the vinaigrette. No, it’s a simple vinaigrette, he replied.). There’s something hypnotizing about deleafing an artichoke, methodically working your way down to the tender core. The process takes so long, and yet the prize at the end is so fleeting. But it’s worth it, especially when it’s as simple and as delicious as this one. Texas brisket is everything Kansas City brisket is not. It’s tender and juicy, and served with all of that marbled fat and connective tissue still melting into the rosy meat around it. It’s sliced thick, so you get the satisfaction of sinking your teeth into it. And it’s flavorful. Texas brisket is great. In spite of all of the hype surrounding the barbecue at Franklin Barbecue, Aaron Franklin‘s smoked brisket turned out to be everything I had hoped for, and more. Disclaimer: I didn’t have to stand in the restaurant’s famously long line for it, and neither did I pay for it. But, given how good it was, I’d happily go back and do it right. It was fantastic. Fried tofu, fried tofu soup, grilled fish, pickled vegetables. This dish, the restaurant’s namesake, is always offered à la carte in various preparations. However, I think one version of it is included on the tasting menu (chef Alexandre Gauthier may have added it on to my menu; I’m not sure). Regardless, I’m very thankful that I got to try it. Lamentably, no worthwhile frog legs can be found in France, Gauthier told me. The best ones, he said, come from Romania. That’s where he got these meaty thighs, which he served to me à la meunière, wearing a mantle of lemony froth in a bowl dotted with tiny croutons. The meat was incredibly clean-tasting, and because Gauthier only buys fresh frog legs – never frozen ones – the texture was incredibly tender. I’ve never had frog legs this good. Chef Joshua Skenes professes to use only the best ingredients he can get. But this year, he started focusing much more on using the best ingredients he can get locally from the San Francisco Bay, and the nearby coastline that stretches north and south from it. From the cold, coastal waters of Mendocino County he gets beautiful, fat sea urchin, which he served to me perched on a crusty rind of levain bread that had been soaked in a meaty sauce made from the toasted bread. The bread had only been set in the sauce long enough for it to soak halfway up the spongey mie, leaving the crust on top crunchy. I am partial to bread crust (almost to the exclusion of the fluffy stuff in between). For me, this little bite was a magnificent meeting of textures and flavors. White miso and creamy mussel sauce. Beach plants. White truffle, pasta, celeriac, and Brussels sprouts tops. I am dependent on late-autumn trips to Europe to have this seasonal, French classic. 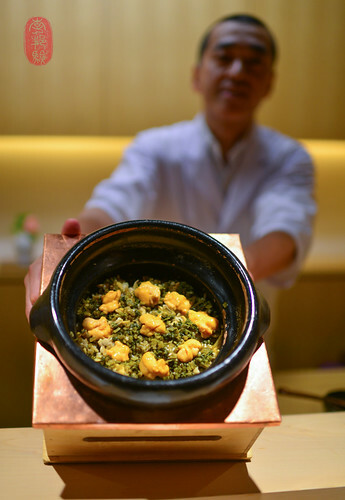 In the rare instance this dish appears in the United States – for example, at Daniel, where I last saw it – you won’t find hare blood being used for the civet sauce (our country’s unnatural fear of bacteria makes it impossible). But, far beyond the novelty of this dish, is the tremendous quality and flavor that Swedish chef Mikael Jonsson injected into his version at Hedone. Hare can be cranky. But unsurprisingly, Jonsson captured the best of it: a dark, rich meat accompanied by an equally moody sauce that is a complex, merry-go-round of flavors: coffee, red wine, liver, tobacco. When I needed a moment from the dizzying ride, a fair Brussels sprout leaf, simply sauteed in a little oil, and a side of plainly dressed pasta, with but little more than some white truffle, made for a soft landing. It was clean and light, yet immensely soulful and satisfying. It was exquisite. Liver, feuille de bric, pecan milk, pecan honey. We tried three different varieties of pork at Butagumi. It really doesn’t matter which one was my favorite (the margin among them was razor-thin, so I picked the meishan-ton, a sirloin cut). 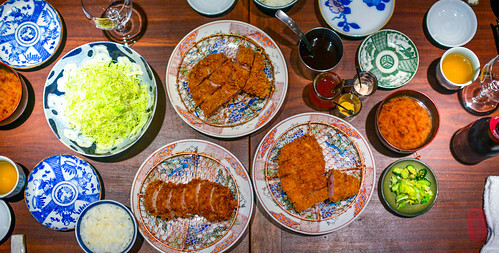 It was the breading – a lacey, golden-brown shell that was more of a halo than a crust, it was so light – that earned the pork katsu at Butagumi a place on this year’s list. Sunchoke, date, coffee, bone juice. In a puff pastry dome: grilled pigeon breast, confit of its legs, giblets, heart, liver, gizzards, and a farce (stuffing) made from all of these parts mixed with grilled mushrooms, like black trumpet, porcini, and shiitake (depending on the season). 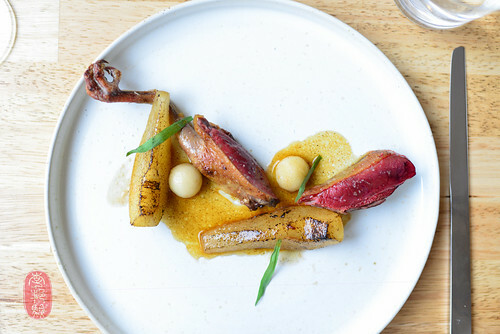 The pigeon tourte was baked in the wood-fire oven and served with a slowly grilled sunchoke, a dollop of date-coffee puree, and sauced with the roasting juices taken from the grilled bird bones. This was a slice of Old World craftsmanship and quality I rarely see anymore. Bottarga, salmon roe, nori, and baby anchovies. My little bowl of tender, short-grained rice came with a tray of condiments: a thick paste of bottarga, some glowing-red salmon roe, a tangle of baby anchovies, and super-crisp sheets of nori. There was so much condiment, and so little rice. Finding the right balance, and the self-control to make it so was every bit as important as the quality and simplicity of the ingredients. With its own tallow and jus. Dear Christopher Kostow: You shouldn’t serve things like Bryan Flannery’s dry-aged côte de boeuf family-style. It causes petty jealousy and stabby behavior among sharing diners. But thank you for serving it anyway. It was one of the best things I ate all year. Striploin and tongue with wasabi and salt. Side of watercress dressed with buckwheat vinegar. Rice with scallop and shrimp fritter. 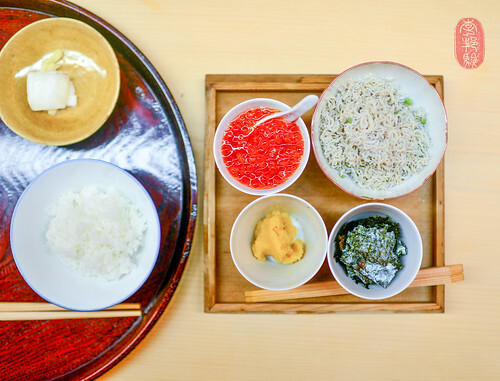 For our rice course at Fukamachi, a Michelin-starred tempura house near Tokyo’s Kyobashi Station, we were offered three choices. All three included rice, with bits of chopped fried tofu mixed in, and a tempura fritter of scallop and shrimp. The ten-don presented the whole fritter on top of the rice, with some soy-based sauce drizzled over it. The ten-cha was the same as the ten-don, but with tea poured over it all. Lastly, the ten-bara had the fritter chopped up and mixed into the rice. We ordered the first and last versions, and the latter was my favorite. I loved that everything was pre-mixed, so that every bite contained a little crunchy, a little seafood, and a little rice. Kale, sour cream, white beer. Flemish chef Kobe Desramaults impressed me with this comforting bowl of warm mussels that, with some torn curly kale, frothy whipped sour cream, and white beer, struck an incredible balance of salt and sour, anchored in a deep, satisfying umami. I had a few versions of sakura ebi rice in Japan (sakura ebi is a tiny shrimp that is in season during the cherry blossom “sakura” festival). The version I had at Den was my favorite. Zaiyu Hasegawa, the restaurant’s sprightly chef with an almost childlike enthusiasm, presented us a giant clay pot of rice paved with these shrimp, which had been fried shell-on so they were crispy. They were nicely seasoned too. Den mixed everything together, and then served us individual portions in bowls. Seconds? Always. Thirds? Just this once. “We have to order the gyukatsu,” my friend Tomo insisted. “It was one of the best things I ate last year.” And so it was, as it was one of the best things I ate in 2014. I wouldn’t have guessed from the looks of Mille Caresses – a sleek wine bar focused on Bordeaux and Burgundy – that the food would be very good. But these finger sandwiches, with top-quality wagyu beef suffused to two slices of toasted white bread, were amazing. The rosy, buttery meat was so fatty and delicate, it almost melted away. Fresh sea urchin, short-neck clam and wasabi buds, miso soup, pickled vegetables. A single slip sole, no longer than my hand from front to end: Stephen Harris, chef of The Sportsman, served the entire fish, beautifully cooked, glazed in seaweed butter. I gently flaked the delicate white meat off its spine, working my way slowly from one end to the other, and then flipped it over for a double helping. From the moment I started until I stopped, I don’t think I looked up from my plate once. This was just one example of the many, simple pleasures that finds me thinking so fondly of Harris’s corner on the coast of Kent year after year. Dried first-of-the-season plums, warm almond oil. CLICK HERE to see ten more dishes from 2014 that I found exceptional and worth mentioning. A note on bread: In my opinion, the ongoing debate about bread service (whether to serve, or not to serve it; to charge, or not to charge for it) is easily resolvable: charge me for it if you must (although, why you’re not quietly building it into your food cost is a mystery to me), but don’t offer it unless it’s very, very good. I don’t need it. I also don’t need a half a dozen or more varieties of it either, because in almost every instance of such grandstanding, the majority is disappointing, if not inedible in total. The good news is that I found a lot of very good bread in restaurants in 2014, and overall, I do think that bread in restaurants is getting much, much better. Bread isn’t the sort of thing that I would categorize as a dish for the purposes of the list above (although, some bread that I’ve had in restaurants is so good that I could justify making an entire meal out of it alone). So, I started appending a paragraph to the end of this annual list to dog-ear some of the restaurants that are serving noticeably good bread. 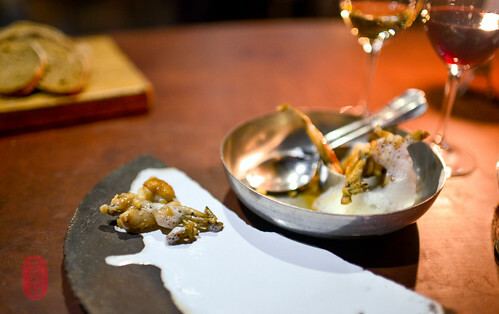 Last year, I mentioned Bar Tartine in San Francisco as serving exceptional bread. Along with Tartine Bakery, it very much deserves to be mentioned again as a standard bearer in American bread making (master baker Chad Robertson has dedicated a whole cookbook, entitled “Tartine Bread,” to the subject). The Scandinavians are still shaming the world with their bread-baking abilities. In 2014, I had the opportunity to visit the original location of Nicolai Nørregaard’s restaurant Kadeau on the Danish island of Bornholm, and found the bread there just as terrific as the bread was at his restaurant’s second location in Copenhagen, about which I first reported last year. In addition to regular white-crusted bread, Oaxen Krog in Stockholm serves a traditional Swedish brown bread in a skillet, made of beer and sweet syrup, that was pretty unforgettable. Reminiscent, in form, of the unsweetened skillet cornbread that I’ve had at Sean Brock’s Husk in Charleston, chef Magnus Ek’s bread is much darker and stickier, benefitting greatly from a scattering of large-format Maldon crystals across the surface. Chef Christopher Haatuft was certainly playing to my preferences when he served me a whole loaf of his house-baked bread at Lysverket in Bergen, Norway, which he had instructed some poor cook to hollow out, leaving only a beautiful, caramelized tunnel of crust. All joking aside, he makes really great bread, including a dark, dense dill bread in nugget form. 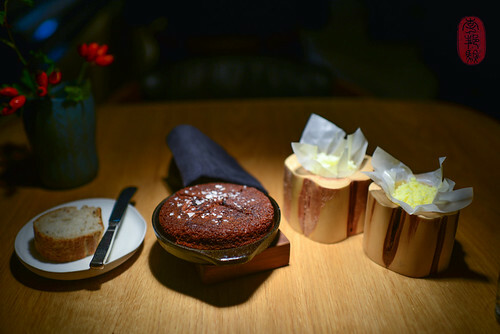 Following the baking tradition of his culinary forefathers to great effect is Daniel Burns. The bread he makes, served with soured butter, at his restaurant Luksus in Brooklyn, is phenomenal. It has that meteor-like crust that I love so much, and a moist, sturdy crumb with some elasticity. And just look at this half-loaf that Kobe Desramaults served us at his restaurant in de wulf with butter and whipped lard. How could you not like that? * Although I created this annual post ten years ago with the title “best of…,” in the years since, I have come to dislike the misleading nature of it (for a more in-depth discussion why, read here). I do not claim, of course, that these are the 25 best dishes from the year 2014, for I have not eaten all of the food prepared in all of the restaurants around the world. Even if I were, by some gastronomic miracle, to have done so, and survived, who am I to pronounce what is the “best?” Rather, these are the best dishes that I had in 2014, in my opinion. That is why I have deliberately avoided using the word “best” to describe the food mentioned in this post, preferring, instead, to refer to them as “my favorite” dishes. I realize this is a rather pedantic point of clarification, but one that is important to me. ** Orlando served a version of this dish at his dinner at the Twelve Days of Christmas. It was, principally, the same dish, except the crosnes had been swapped out for dried beets. Although still very good, I thought the leathery texture and sweetness of the beets overlapped too much with the dried plums. It was missing that crunch of the crosnes, with a more neutral, fresh flavor. Photos: Tonkatsu at Butagumi in Tokyo, Japan; cuisses de grenouille at la Grenouillère; la Madelaine-sous-Montreuil, France; shaving white truffles over live scallop cooked in its shell at Providen in Los Angeles, California; the sea urchin toast at Saison in San Francisco, California; pigeon with pears and tarragon at Souvenir and Ieper, Belgium; rice with anchovies, roe, and nori at Matsukawa in Tokyo, Japan; and steamed rice with sea urchin, clams, and wasabi buds at Ishikawa in Tokyo, Japan; and the traditional Swedish brown bread at Oaxen Krog in Stockholm, Sweden. ~ by ulterior epicure on January 4, 2015. I so enjoyed reading this post. Maybe I am mistaken, but I found several of the hyperlinks to photos to be incorrect.